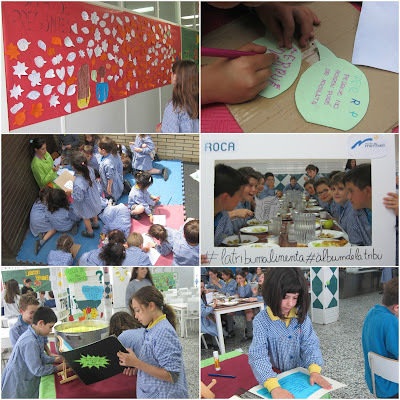 A few days ago "La Tribu" of the Meritxell School has started! The reporters are working hard. They are collecting all the questions of students, and asking to differents members of community education to resolve all doubts of children. Every time we have more pictures of children and some drawings too of kids. We show that around the dinning-room. Students are getting involved more and they know that the "espai migdia" is a time and place in which they can enjoy and choose what they want to do. Increasingly, there are more students that want participate to complete our recipe. They are giving us a lot of recipes about they favourite meal and trucks for cook better.